I've been working on making some items for Carol's Made for China project, and this little girl is one of them. I'm not quite sure if she's done or not. Should I make her features out of felt rather than embroider them? Add a little band of decorative ribbon, put some barrettes in her hair? But while I'm pondering all of that, I'm pretty sure I'm not going to put on any limbs (sorry, Becca!). I was going for that Fisher Price Little People look, those dolls I loved so much when I was a kid. I went to five different places, and couldn't find any of the wooden blanks that Carol painted (so cute! 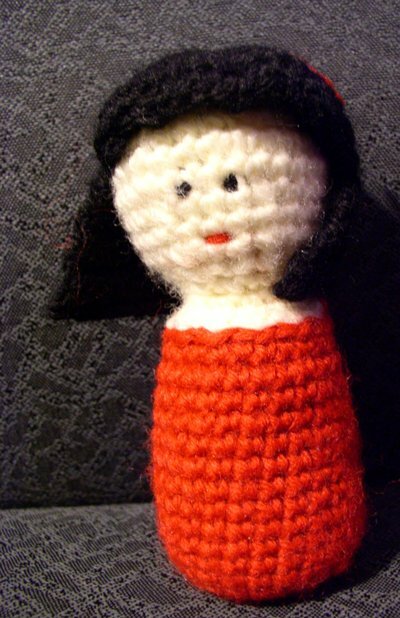 ), so I just started crocheting and Scarlet is what I came up with. She's about 5 inches tall, and I like the way she fits in my hand, the simplicity of her. I'm going to make at least a few more for the project, but after that, I just might not be able to stop. She has TOTALLY got the fisher price look going - old school fisher price. I love her. You're so creative! Home run, chiqua!